In this name, the family name is Kasmirski, not Luís. * Senior club appearances and goals counted for the domestic league only and correct as of 6 November 2016. 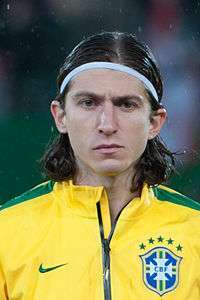 Filipe Luís Kasmirski (born 9 August 1985), known as Filipe Luís, is a Brazilian professional footballer who plays as a left back for Spanish club Atlético Madrid and the Brazil national team. A player of tireless approach, he played most of his professional career in Spain, beginning at Deportivo de La Coruña, where he spent four seasons. In 2010, he joined Atlético Madrid, and won several trophies including La Liga. In July 2014, he joined Chelsea for £15.8 million, helping them win the League Cup and Premier League, but returned to Atlético a year later. Filipe Luís made his debut for Brazil in 2009 and has since earned over 20 caps, helping win the 2013 FIFA Confederations Cup on home soil, and representing the nation at the 2015 Copa América. Filipe Luís was born in Jaraguá do Sul, Santa Catarina. Coming from Figueirense as an attacking midfielder, he had his first taste of football in Europe with Ajax in 2004, spending one full season there. Despite never playing a first-team match for Ajax, he credits the Dutch club for helping him learn tactical aspects of the game, as well as aiding his development by allowing him to train with players such as Rafael van der Vaart and Wesley Sneijder. After leaving Ajax, Filipe Luís was registered under Rentistas, an Uruguayan club that had a partnership with his agent Juan Figer. In August 2005, Filipe Luís was signed by Real Madrid on a loan contract. He would spend most of the season, however, with its B team in the Segunda División. The move was not made permanent after high financial requests from the Uruguayan club. In August 2006, Filipe Luís joined Deportivo de La Coruña, with a buy-out option of $2.2 million. He did not have many opportunities in his first season, but his loan was extended for a further year with the same buy-out clause; in the 2007–08 campaign, after first-choice Joan Capdevila's departure to Villarreal, he went on to establish himself as first-choice left-back. On 10 June 2008, Filipe Luís was purchased and signed a five-year contract. During his debut season as a Deportivo player, he was the only outfield player in La Liga to appear in all 38 league games, scoring twice. On 23 January 2010, immediately after netting the opener in a league game against Athletic Bilbao (an eventual 3–1 home win), Filipe Luís sustained a horrific injury to his right fibula after opposing goalkeeper Gorka Iraizoz landed on his leg. At the time, he had played all matches and minutes during the campaign, and Deportivo stood fourth in the table. Amazingly, he returned to action just four months later, appearing in the second half of the club's 1–0 home win against Mallorca and being involved in the play which led to Riki's goal. The Galician club would eventually finish in the tenth position. On 23 July 2010, Filipe Luís signed for five years with Atlético Madrid for an undisclosed fee, reported to have reached €12 or 13.5 million. His official debut came on 26 September at home against Real Zaragoza, where he set up compatriot Diego Costa for the game's only goal, receiving Man of the match accolades. In his first season, Filipe Luís constantly fought for first-choice status with youth graduate Antonio López. On 10 April 2011, he scored his first goal for Atlético in a 3–0 home win over Real Sociedad. On 17 January 2013, Filipe Luís scored the second goal in a 2–0 defeat of Real Betis for the Copa del Rey. He also played the full 90 minutes in the final against Real Madrid, which ended with a 2–1 win at the Santiago Bernabéu. Filipe Luís made his first appearances in the UEFA Champions League in the 2013–14 edition, helping the Colchoneros secure first place in Group G by scoring once in a 4–0 home routing against Austria Wien. During the league campaign, he was part of a stellar backline that only conceded 26 goals in 38 games as Atlético won the league title for the first time in 18 years; additionally, he featured in ten contests in the Champions League, including the 1–4 final loss to Real Madrid in Lisbon. For his efforts in his final season, Filipe Luís was nominated as the best defender in La Liga, alongside then teammate Miranda and Real Madrid's Sergio Ramos. On 16 July 2014, Chelsea and Atlético agreed a fee of £15.8 million for the transfer of Filipe Luís, subject to personal terms. The player ultimately signed a three-year contract on 18 July 2014. Upon the move he said, "This move is a dream come true for me. I now have the opportunity to play for Chelsea, and also in the Premier League. I’m very happy and looking forward to getting started and giving my best for the team during the coming seasons." Filipe Luís made his debut in a pre-season friendly against Wolfsberger AC, on 23 July 2014. His squad number was confirmed as 3, replacing Ashley Cole who moved to Italian side Roma soon before Filipe Luís' arrival. In Chelsea's first match of the league season, away to Burnley, Filipe Luís was an unused substitute with César Azpilicueta playing at left back. He expressed that he was content to be second choice behind Azpilicueta if Chelsea were playing well, comparing his situation to the team's experienced goalkeeper Petr Čech, who had been benched for Thibaut Courtois. Filipe Luís made his debut in Chelsea's third league match, playing the last seven minutes of a 3–6 win at Everton in place of Eden Hazard on 30 August. He started for the first time on 17 September, playing the entirety of a 1–1 home draw against Schalke 04 in Chelsea's first game of the Champions League group stage. With Azpilicueta suspended, Filipe Luís started a Premier League match for the first time on 26 October, a 1–1 draw away to Manchester United. Filipe Luís' only goal for Chelsea came on 16 December 2014, a 25-yard free-kick in a 1–3 League Cup quarter-final win away to Derby County. However, Azpilicueta played at left-back in the final, which Chelsea won 2–0 against Tottenham Hotspur for Filipe Luís' first silverware at Chelsea. On 3 May 2015, he came on as an added-time substitute for Eden Hazard in Chelsea's 1–0 home win over Crystal Palace which secured the league title. Chelsea manager José Mourinho confirmed on 21 July that Filipe Luís would be leaving Stamford Bridge after only one year. On 28 July 2015, Filipe Luís re-joined Atlético Madrid on a four-year contract for an undisclosed fee. He made his return to the team on 22 August as they opened the season with a 1–0 home victory over newly promoted Las Palmas; in a 3–0 win in the reverse fixture the following 17 January he scored his first goal since returning. Thirteen days after that, he was sent off in the first half of a 2–1 loss at Barcelona for a challenge on Lionel Messi, and teammate Diego Godín was later also dismissed; the duo escaped criticism by manager Diego Simeone. On 7 August 2009, Filipe Luís was called up by Brazil for the first time, replacing injured Marcelo for a friendly against Estonia; he did not leave the bench in the 0–1 away success, on 12 August. Filipe Luís made his debut for the Seleção in a 2010 FIFA World Cup qualifier against Venezuela, on 15 October 2009. He was selected in the Brazilian squad which won the 2013 FIFA Confederations Cup on home soil, although he did not enter the field of play during the competition. He was one of seven players put on standby for the 2014 World Cup. On 11 October 2014, in the 2014 Superclásico de las Américas in Beijing, Filipe Luís played the entirety of a 0–2 victory against Argentina. With Marcelo absent through injury, Filipe Luís played every minute of Brazil's campaign at the 2015 Copa América in Chile, as they reached the quarter-finals. 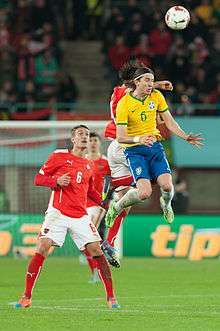 On 17 November 2015, Filipe Luís scored his first goal for Brazil in a match against Peru for the 2018 FIFA World Cup qualification. All four of Filipe Luís' grandparents were European immigrants who came to Santa Catarina; his paternal grandfather left Poland during World War II. He is also of Italian ancestry. In 2014, Filipe Luís' second child, a daughter named Sara, was born. He also has a son, Tiago. Filipe Luís (right) celebrating Chelsea's victory in the 2015 Football League Cup Final, alongside compatriots Oscar and Willian. ↑ "Barclays Premier League: notification of shirt numbers" (PDF). Premier League. p. 5. Retrieved 3 January 2015. ↑ "Filipe Luis". FIFA.com. Retrieved 21 January 2014. ↑ "Teenage Kicks: Filipe Luis". Chelsea F.C. 9 March 2015. Retrieved 9 March 2015. 1 2 "The weekend interview: Filipe Luis". Chelsea F.C. 27 September 2014. Retrieved 27 September 2014. ↑ "El Deportivo ejerce la opción de compra del lateral Filipe Luis" [Deportivo buys out fullback Filipe Luís] (in Spanish). La Voz de Galicia. 11 June 2008. Retrieved 11 June 2008. ↑ "Filipe Luis se destroza el tobillo tras marcar un gol" [Filipe Luis shatters ankle after scoring] (in Spanish). Marca. 24 January 2010. Retrieved 24 January 2010. ↑ "El brasileño Filipe Luis se convierte en nuevo jugador del Atlético de Madrid" [Brazilian Filipe Luis becomes new Atlético de Madrid player] (in Spanish). Atlético Madrid. 26 July 2010. Retrieved 27 July 2010. ↑ "Deportivo y Atlético de Madrid cierran el traspaso de Filipe" [Deportivo and Atlético Madrid seal the transfer of Filipe] (in Spanish). Deportivo's official website. 23 July 2010. Retrieved 23 July 2010. ↑ "Holders Atlético strengthen with Filipe Luís". UEFA.com. 26 July 2010. Retrieved 27 July 2010. ↑ "Filipe finalises move". Sky Sports. 24 July 2010. Retrieved 28 July 2010. ↑ "Atletico edge past rock-bottom Zaragoza". ESPN Soccernet. 26 September 2010. Retrieved 4 April 2011. ↑ "Luis, Suarez and Aguero on target for Atletico". ESPN Soccernet. 10 April 2011. Retrieved 18 April 2011. ↑ "Insaciable Atlético" [Insatiable Atlético] (in Spanish). Marca. 17 January 2013. Retrieved 7 June 2014. ↑ "Atlético beat Real Madrid to win Copa del Rey after Ronaldo sent off". The Guardian. 17 May 2013. Retrieved 6 June 2014. ↑ "Remorseless Atlético through at a canter". UEFA.com. 6 November 2013. Retrieved 6 June 2014. 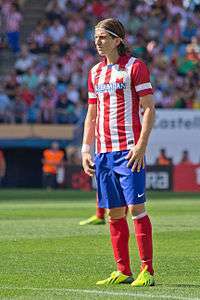 ↑ "Chelsea target Filipe Luis moves closer to Atletico Madrid exit after Spaniards sign £8m Granada defender Guilherme Siqueira". Daily Mail. 6 June 2014. Retrieved 6 June 2014. ↑ "Real Madrid 4–1 Atlético Madrid". BBC Sport. 24 May 2014. Retrieved 6 June 2014. ↑ Fernandez-Abascal, Eduardo (14 October 2014). "Chelsea Duo Thibaut Courtois And Filipe Luis Nominated For La Liga Awards". International Business Times. Retrieved 15 October 2014. ↑ "Filipe Luis: Chelsea sign Atletico Madrid defender for £15.8m". BBC Sport. 18 July 2014. Retrieved 18 July 2014. ↑ "Luis agreement reached". Chelsea.com. 16 July 2014. Retrieved 16 July 2014. ↑ "Agreement reached with Chelsea for the transfer of Filipe Luis". Atlético Madrid. 16 July 2014. Retrieved 16 July 2014. 1 2 "Filipe Luis deal completed". Chelsea.com. 18 July 2014. Retrieved 18 July 2014. ↑ "Match report: WAC RZ Pellets 1 Chelsea 1". Chelsea F.C. 23 July 2014. Retrieved 1 August 2014. ↑ "Squad number changes". Chelsea F.C. 15 August 2014. Retrieved 15 August 2014. ↑ "Burnley 1-3 Chelsea". BBC Sport. 18 August 2014. Retrieved 18 August 2014. ↑ Johnson, Simon (25 September 2014). "Jose Mourinho has taught me to put the collective first - Chelsea's Filipe Luis happy to play waiting game". Evening Standard. Retrieved 19 October 2014. ↑ "Everton 3-6 Chelsea". BBC Sport. 30 August 2014. Retrieved 30 August 2014. ↑ "Chelsea 1-1 Schalke". BBC Sport. 17 September 2014. Retrieved 17 September 2014. ↑ McNulty, Phil (26 October 2014). "Man Utd 1-1 Chelsea". BBC Sport. Retrieved 26 October 2014. ↑ Faulks, Will. "Filipe Luis Scores Stunning Goal For Chelsea Against Derby – Can He Force His Way Into The Side?". CaughtOffside. CaughtOffside. Retrieved 16 December 2014. ↑ "Chelsea 2-0 Tottenham". BBC Sport. 1 March 2015. Retrieved 1 March 2015. ↑ "Filipe Luis: Jose Mourinho says Chelsea left-back set to leave". BBC Sport. 21 July 2015. Retrieved 21 July 2015. ↑ "Filipe Luis: Atletico Madrid re-sign Chelsea defender". BBC Sport. 28 July 2015. Retrieved 28 July 2015. ↑ "Atl Madrid 1–0 Las Palmas". 22 August 2015. Retrieved 23 August 2015. ↑ "Las Palmas 0-3 Atletico Madrid: Simeone's men stay at summit". Goal.com. 17 January 2016. Retrieved 23 April 2016. ↑ "Diego Simeone spares dismissed duo criticism after Barcelona loss". BBC Sport. 30 January 2016. Retrieved 30 January 2016. ↑ "Player Ratings: Brazil 0–0 Venezuela". Goal.com. 15 October 2009. Retrieved 15 October 2009. 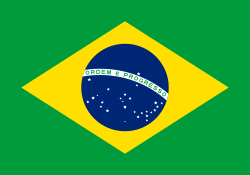 ↑ "Confederations Cup 2013: Brazil team profile". BBC Sport. 10 June 2013. Retrieved 16 July 2014. ↑ "World Cup 2014: Kaka and Robinho omitted from Brazil squad". BBC Sport. 13 May 2014. Retrieved 14 May 2014. ↑ "Argentina 0-2 Brazil". BBC Sport. 11 October 2014. Retrieved 11 October 2014. ↑ "Brazil 3-0 Peru: Costa shines as Dunga's men seal vital win". Goal.com. 18 November 2015. Retrieved 18 November 2015. ↑ "Profiles - Filipe". DLC - an official fanclub. Retrieved 5 March 2015. ↑ "Filipe Luís celebra nascimento de sua segunda filha Sara" [Filipe Luís celebrates the birth of his second child Sara]. Lance! (in Portuguese). 22 September 2014. Retrieved 24 September 2014. ↑ "Após empate na Champions, lateral Filipe Luis cuida do filho Tiago" [After draw in the Champions League, full-back Filipe Luís cares for his son Thiago]. O Globo (in Portuguese). 23 April 2014. Retrieved 24 September 2014. 1 2 "Filipe Luis". Soccerway. Retrieved 13 March 2014. ↑ "Filipe Luis". Soccerbase. Retrieved 11 January 2015. Wikimedia Commons has media related to Filipe Luís Kasmirski.